In this age of digital downloads, instant messaging and up-to-the-minute updates on people's various or nefarious activities, it's nice to actually get a piece of mail. And it's even more exciting to get a package sent via Airmail all the way from Cyprus. Now, occasionally my inbox--both my physical and electronic one--get various packages of new music stuffed inside of it. While some gifts are good, others are not (and they mysteriously find another box to live in). That's why when a new CD that's really good comes my way, it's like a miracle of science. So, on this week's World Music Show (1/4), we'll get the bounus of an excellent CD that came my way this past week, as well a treat from another CD that came my way some time ago. The first package did indeed come all the way from Cyprus. 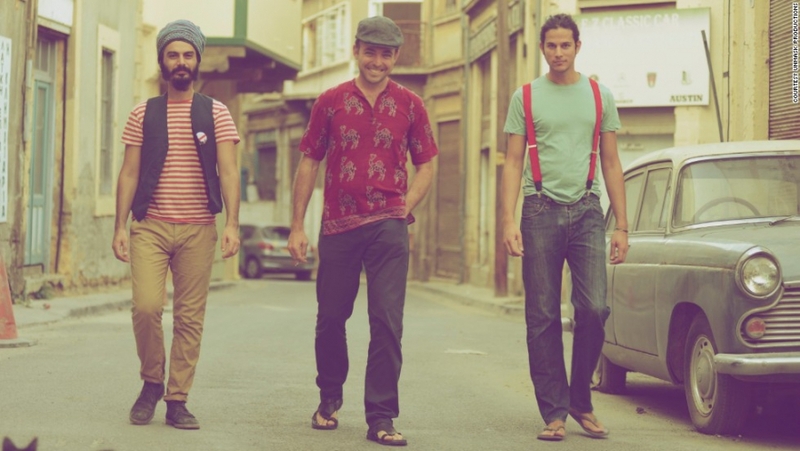 The band Monsieur Doumani, who found The World Music Show in the ether, are a trio who formed in 2011 in Nicosia. The band, who play instruments such as the tzouras, the guitar and wind instruments, focus on rearranging Cypriot traditional songs--but they add their own particulary twist to these as well as to thier own composed tracks. Sung in the Cypriot dialect, their own songs are inspired by contemporary Cypriot society--such as the recent financial crisis that hit the island or by the "corrupted political system." Off their debut album, called "Grippa Grappa," we'll hear two songs: a traditional song called "The Forest Ranger," and another traditional song called "My Baggy Trousers." As you can tell, this band has a sense of humor. Their songs are quick, catchy and fresh. Paired with Monsieur Doumani in the first set will be a couple of old-style songs from Italy, one from a 1950s Italian film star who also made a name for himself singing. Fred Buscaglione was sort of like Dean Martin--a guy who could sing and act, and whose persona was that of a rogue. The other Italian singer is Giorgio Conte. Conte apparently is not as well known as his older brother, Paolo, who is one of Italy's most famous singers. However, after Giorgio gave up is career as a lawyer back in the 1990s, so he could dedicate is time to music, he's quickly garnered quite the following. Other chunks O' music to pay attention to in this first hour (but really, all chunks are good), will be one that features some music also sent to me via mail. Wheras the first CD mentioned is a fully produced CD, this one is a homemade batch of songs sent by my good friend Josh. Josh is a fellow music lover and he's introduced me to all sorts of music, including many that are heard on the show. Off of one of his many compilations, we'll hear the Brazilian singer Bid as well as the Brazilian singer Fernanda Abreu. Later on, in hour two, we'll hear another Josh selection from the band We Are Enfant Terrible. But, featured in this set will also be a couple of tracks from the alternative Mexican rock band Cafe Tacuba. In another set of music, we'll hear a trifecta of stringed instruments, including the guitar, as played by King Sunny Ade, the Kora, as played by Issa Bagayogo and the Biram, played by one of the last masters of this instrument--Mamane Barka. The Biram is a traditional instrument used by the Boudouma tribe in Eastern Niger. They are fishing nomads living on the border of lake Tchad. The instrument is a 5 string kind of harp, and looks like a pirogue, one of the wooden barks used on the lake. It is played only by initiated masters. For the end of the first hour, we'll hear from Orchestra Boabob, the band Fosforo, and two tracks from the lovely Zee Avi, who sings and plays a mean ukelele. In hour two, we'll get a chance to dance around, first thanks to some Tropical Discotheque music called Sofrito. We'll hear from the band Descarga Bontempi. Sofrito is a style that was created in the clubs South London, and it takes heavy tropical dancefloor sounds from Africa, the Caribbean and South America and mixes them up to create a unique, danceable party. Speaking of clubs, we'll also visit the Impala Lounge, which is a place in Paris that specializes in West African music--both live and Dj-inspired. As mentioned earlier, we'll hear some alternative French music by the band We Are Enfant Terrible, as well as some up-tempo music from the band Lo Jo. Then, taking a left turn, we'll head to India to check out some Bollywood inspired songs by Asha Bhosie and Panjabi MC. Plus, we'll hear from one of the best Indidan slide guitar players around, Debashish Battacharya. Closing out the show will be some groovy, electronic music by Ursuala 1000 as well some thumping music from Michael Franti and Spearhead. Whether the music comes via Airmail or downloads or even via CD, the World Music Show aims to please. Tune in Saturday nights at 8:00 p.m. on Richmond Public Radio, 88.9FM WCVE or via this website. You can follow the show via Twitter, @wcveworldmusic.